A week ago I met my friend Cat for a photowalk in Richmond Park, an arrangement we had made some time previously, but we were incredibly lucky with the weather on the day as the sky was clear blue and the sun was shining. The light was beautiful and warm, brightening up a Winter day with golden pools of sunlight and deep shadows across the grass and trees. 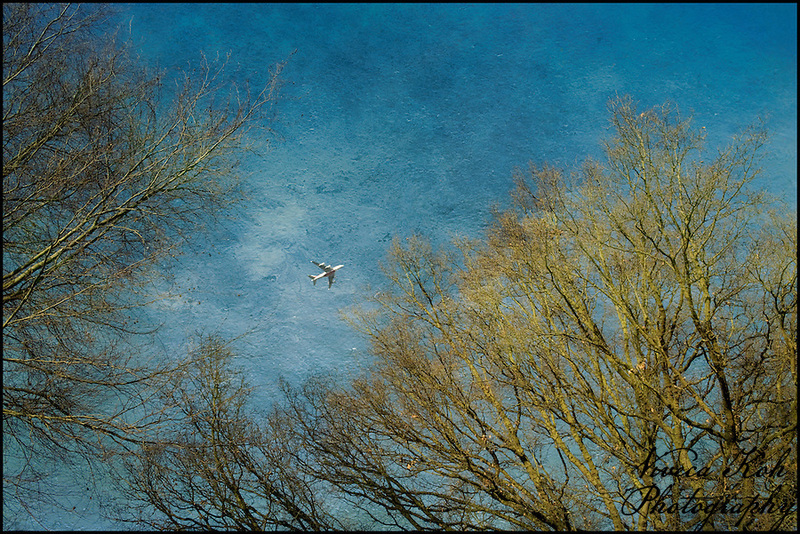 As we were walking I looked up towards the sky and saw the aeroplane through the gap in the trees, and fired off the shot really quickly before it was obscured by branches or too far up the frame. I processed this one with a simple texture layer to resemble an oil painting, in order to add some more interest to the sky and to bring out the trees a little more. 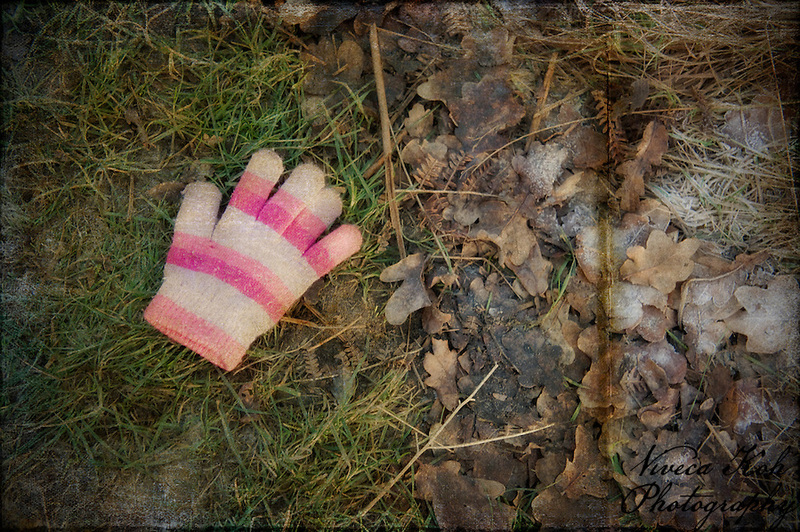 The glove was at the edge of a path where the leaves and grass were still in shadow and remained crispy with a white coating of frost. I loved the colour contrast between the muted organic matter and the gaudy stripes of the woollen glove, so when I processed this one I added a creased paper texture in a sepia shade which enabled me to ‘knock back’ the leaves further, and then enhance the glove by masking out some of the paper colour and allowing its’ brightness to shine through. This entry was posted on Tuesday, January 24th, 2012 at 22:24. It is filed under Lectures & Projects, Textured Photographs and tagged with Digital Image Manipulation, Fine Art, photo, photograph, Photography, Textures. You can follow any responses to this entry through the RSS 2.0 feed. My husband introduced me to your work in Transmitter. I love your images of derelict buildings, distressed wooden surfaces and Forest lights (Guardians of the Forest). Such images resonate well with me as an amateur artist and photographer. I like the first photo. It looks like an artistic painting. Cool shots. Like the texture in the first one, well done. The 2nd is kinda creepy. There’s always something about a single glove that’s a bit creepy, isn’t there? Thanks for taking a look! Terrific images Viveca. The first one is brilliant. Thanks so much for your feedback Edith. What a wonderful pair of images here, Viveca, I am so happy to see you out and shooting! The first picture is really great, you are indeed the master of textures in the world of photography! The second image is absolutely dramatic, profound and full of great tension! There is a story in that glove, and you’ve captured and shared it here with us all just perfectly!